I’ve never been one to eat much protein and after becoming vegetarian about 8 years back, I ate even less of it. What I found is that when you don’t eat enough, you start eating everything in sight in order to fill the void your body is trying to fill, only to find you never actually fill up! Protein is a must, the body needs it to be strong and healthy. Your body uses it to repair tissue (which is why it is so important athletes and body builders get plenty of it). The body also uses it to make enzymes, hormones, and other chemicals the body needs in order to maintain proper functioning. Protein is also necessary in order to strengthen bones, muscles, cartilage, blood, and even the skin. Being a beauty blogger, I can’t tell you how important it is for healthy, strong, shiny hair too! When you don’t get enough protein, the body’s metabolism slows down and is sluggish. You find it harder to lose weight. Your immune system is weakened. You may even experience mood swings, joint or muscle pain, and have a harder time concentrating. Women should instead be aiming to get 46 grams of protein a day, (or about .5 x your body weight) and men should be getting about 56. If you’re not getting much protein in your diet, it might be time to explore some more nutritious options to help your body stay strong and healthy. Luckily, being a non-meat eater, I’m not out of options when it comes to getting my protein. Apart from meat, dairy, and eggs, Protein can be found in many plant-based foods, even in spinach! I eat a diet full of beans, legumes, lentils, tofu, quinoa, oatmeal, hummus, peanut butter, nuts, and seeds. I also love to start my day out with a protein shake or smoothie and add some protein-rich superfoods such as unsweetened cocoa powder, flax seed, chia seeds, hemp seeds, almonds, and spirulina. In fact, if like me, you’ve never been much of a big meat-eater, to begin with, there are still lots of ways you can still get that 46 grams of protein in a day! A yummy protein powder I have been drinking and loving lately is Ascent Native Fuel Micellar Casein and Native Fuel Whey powders. Ascent Native Fuel is made with native whey, the new benchmark in whey protein purity. Native whey is the least processed protein available today because it’s filtered directly from high-quality milk. 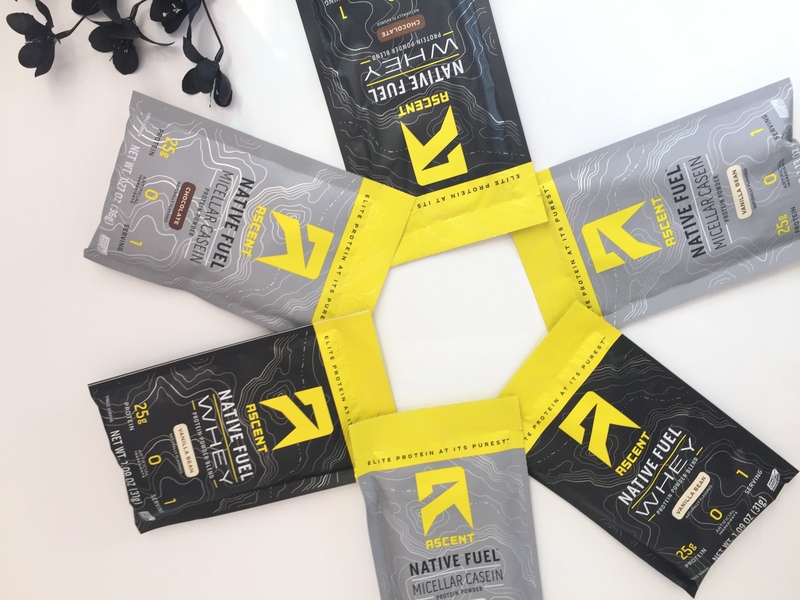 Native whey also contains naturally higher levels of leucine, the key amino acid for stimulating muscle protein synthesis. These protein powders come in vanilla bean and chocolate and are oh so yummy! Plus each serving comes with a whopping 25 grams of protein – making it super easy to get in your daily amount! And without the fat and extra calories of eating other protein-rich meats and foods. What has me absolutely ecstatic is that each serving contains only 1 gram of sugar or less! That is shocking for a protein product! Normally most protein powders and bars have on average around of 12-25 grams of sugar per serving! That is no joke! Over the last 8 years, I’ve been on the constant hunt trying to find good protein shakes and protein bars low in sugar, and they are nearly impossible to find! As you can guess, Ascent protein powders are a powder I will be sticking with for a very long time! Not only are these tasty protein powders extremely low in sugar and high in protein! Yay! But they’re also incredibly low in fat too! Again, incredibly hard to find in high-protein foods! Fat is usually almost always an issue! In the Ascent protein powder mixes, you will only find 1 gram of fat! They’re also low in carbohydrates too! PURE indeed. I have no idea how they do it! Like I said above, these drinks are yummy too! I love that they are sweet but not overly sweet. The amount of sweet is just perfect. You don’t want a protein powder that isn’t sweet as all, as they can taste incredibly nasty. Again, I’m amazed they made this with less than 1 gram of sugar and they still taste great to drink! Protein powders are easily digestible and can reach the muscle within only 30 minutes of drinking. They are great to substitute for breakfast and even better to drink right after working out, in order to help the body rebuild muscle. Ascent Native Fuel™ aims to set a new benchmark in protein purity and is The Official Sponsor of Hard Work™. Drawing from 30 years of experience making protein, Ascent only uses milk from trusted dairy farmers and filters the proteins in its own facilities. Ascent uses zero artificial ingredients and avoids harmful steps such as “bleaching.” Aligning with the admirable qualities in the athletes that Ascent serves — going that extra mile, completing an extra set and never backing down from a challenge – Ascent pushes for high-quality results knowing they do not come without hard work. Ascent Protein also makes some yummy pudding! Try out this yummy Super easy Vanilla Bean Micellar Casein Pudding Recipe below! Mix together until a pudding consistency forms. Add more liquid as needRefrigeraterate for about 10 mins and enjoy! Athletes love this protein powder! Ascent Protein has teamed up with Katrin Davíðsdóttir, dubbed the “Fittest Female Athlete on Earth,” as she continues her journey to the 2017 CrossFit® Games. “I put my body through grueling workouts and need to refuel it with a clean, pure and wholesome food to help aid recovery and enable me to do it all over again. With Ascent Protein I know I’m taking in only what I need – it’s the cleanest you can find out there” says Katrin. She also joins Rob Killian, 2015 Spartan World Champ, as an Ascent Protein ambassador.